Billiards and high-stakes poker are not exactly riveting spectator sports, but you know what would make them surefire TV entertainment? If at the end of each contest, players beat the crap out of each other. Man has long yearned to answer the life-affirming question: "Who is the toughest pool player in the world?" 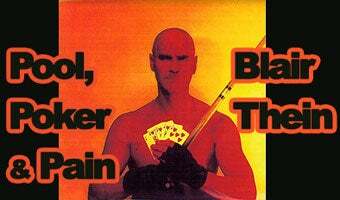 That was the initial brainstorm behind "Pool, Poker, and Pain," an as-yet-unrealized reality show that looks to combine three of the seediest up-and-coming pastimes in America—pool, poker, and mixed martial arts. This is right up there with the modern pentathlon, chess boxing and whatever the heck this is, as one of the great sports-hybrid ideas of all time. After all, all three arenas have a knack for attracting shady, untrustworthy characters willing to risk almost anything to scam somebody out of ten bucks. Throw in the high-rolling gambling element and the potential for seeing untrained, nonathletic pool players put each other in choke holds and I really don't understand why this isn't on Spike already. Extreme billiards! Angry card players seeking revenge for a bad beat! (Literally!) If they would just let them take broken pool cues into the octagon, the pay-per-view alone would bailout our economy.